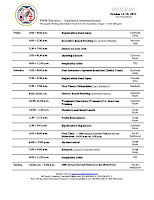 It's time for the PNW District to come together for the First Quarter Meeting of the 2011-2012 administrative year! How fast we hand over the leadership duties from one Optimist leader to the next. Only a few days ago, we were rushed to add new members and go out a high note. The beauty of that strategy is that we also come in a high note. 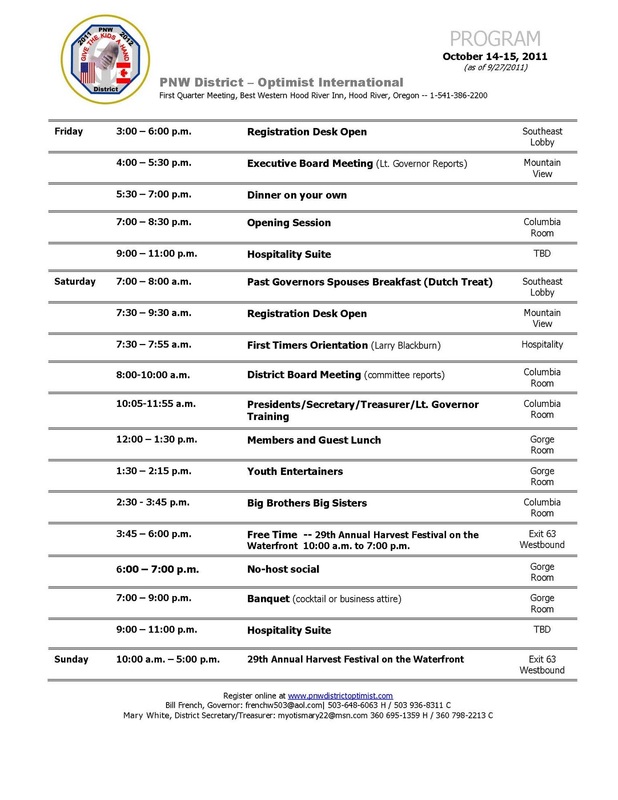 That means our Optimist Club members are already charged up about serving even more kids and they are ready to learn all about the new programs next week in Hood River. Governor Bill French looks forward to welcoming you and sharing the new recognition program for Honor Clubs. Now is the time to plan for retention, recruitment and service. You'll get fresh ideas at the conference to take home and make a difference. You'll also learn all about the scholarship programs and district-wide efforts to help your club succeed. Joining us on her first official visit to the PNW District will be the Region 7 Vice President for 2011-2012 Esthermarie Hillman. Esthermarie hails from the Pueblo Optimist Club in Tuscon, Arizona where she has served since 1996. She has been involved in all aspects of Optimist Club leadership including Distinguished and Outstanding Governor, Certified New Club Builder, Certified International Trainer, and the Optimist International Governance Committee. She is also involved in the Communications Contest for the Deaf and Hard of Hearing and serves as a deaf community coach at the Arizona State School for the Deaf. Esthermarie is committed to the Optimist International Foundation and has fulfilled an Assisting Children through Exceptional Service (ACE) pledge to raise $50,000 for the Foundation. Come and meet Esthermarie and your new governor next weekend (October 14-15) in Hood River. It's the right way to start the new year.